Pranjal Patil | Vipin Das P.
Please ask me only interesting questions,” said the new assistant district collector of Ernakulam, Pranjal Patil. “Otherwise I’ll get so bored.” I mentally scratched off all my questions about success, motivation and challenges. I had to think more creatively, but under the sudden pressure to perform, I crumbled. All I could come up with was: “Why IAS?” She might have been bored already, but she answered sportingly. 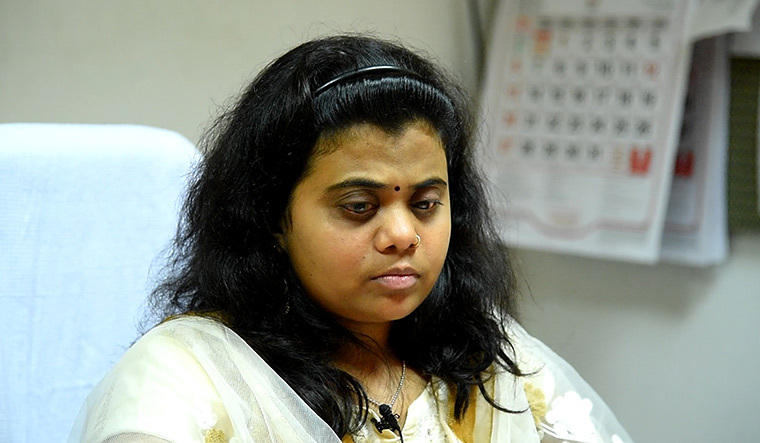 Being visually-impaired, Patil might have preferred a profession where she does not have to face the forced sympathy of people, or their awkwardness around disabled people. But instead of running away from the storm, she walked right into it. The thing about her is that there is no trace of self-pity. Not once did she refer to her disability as setting her back in any way, although it must have in many ways. However, when I brought it up, she addressed the issue without any hesitation, and did not shrink from the questions. “Yes, of course there are discouraging moments in life,” she said. “I get discouraged every day. But don’t we all?” She referred to the time she was rejected by the Railways, despite securing an all-India rank of 773 in the UPSC examination, which made her eligible for the post. She did not give up. Instead, she wrote the examination again, and scored a rank of 124, which helped her realise her dream of becoming an IAS officer. “I believe discouragement paves the way for encouragement,” she said. Once, many years ago, when she had gone to fill her water bottle at the JNU hostel, she found a girl there who was extremely depressed and frustrated with life. Patil spoke to her for a long time. Two years later, she met the girl, who told her how their conversation had given her a new perspective in life. Patil remembers the incident with a lot of fondness. In her spare time, she loves to read biographies and autobiographies. Some of her favourite ones are the autobiographies of Nelson Mandela, Anne Frank and Mahatma Gandhi, whose work she described as “brutally honest”. “Whenever I read a book, I find something that inspires me,” she said.